The death of a spouse or loved one is a very difficult time. Yet even during this period of grief and emotional readjustments, important financial arrangements must be made. Some attention may have been focused on these items prior to a death. This guide, however, was developed to help you prepare for and handle the many details which must be attended to, whether or not any prior arrangements were made. We hope the following information will help to guide you through the many decisions which need to be made and actions which need to be taken in the first few months after death. Not all of the following items may be related to your situation. Also, whenever possible, do let other members of your family or family friends help and take over some of these tasks. Decide on the time and place. Write an obituary. Normally, the mortuary does this, but you may wish to consult with them. Include age, place of birth, occupation, college degrees, memberships held, military service, outstanding work, list of survivors in immediate family. Give the time and place of services. If flowers are to be omitted, decide on appropriate memorial to which gifts may be given (a church, library, school, or charity). Select pall bearers and notify them (avoid men with heart or back difficulties, or make them honorary pall bearers). Take turns answering the door or phone, keeping careful records of calls. See to the needs of visiting relatives and friends. Make appropriate plans for any childcare. Coordinate special needs of the household (e.g., cleaning, grocery shopping, etc.) that might be done by friends. Prepare a list of distant persons to be notified by letter and/or printed notice and decide which to send each. Prepare a list of persons to receive acknowledgements of flowers, calls, etc. Send appropriate acknowledgements (can be written notes, printed acknowledgements, or some of each). If the deceased was living alone, notify utilities and landlord, cancel newspaper subscriptions, and tell the post office where to send mail. Take precautions against thieves. You will need to give copies of the death certificate to many of the offices or agencies you contact. You can purchase certified copies of the death certificate through your funeral director or directly from the county Health Department. There will usually be a charge of a few dollars per certificate. You may save money by using a photocopy when possible, but many companies will require a certified copy. For most circumstances, you initially will want 6-8 copies, but you may need more later. Notify insurance companies, including automobile insurance, of immediate cancellation and request any refund. The proceeds from an insurance policy can generally be paid directly to the named beneficiary. These claims are usually processed quickly and can be an important source of money for the survivors. You should file claims for insurance policies as soon as possible, especially if finances are a concern. It is also important to check on the possibility of income for survivors from these same sources. You may need to make a decision regarding the type of payment plan you desire. Your options might include taking the money in a lump-sum payment, or having the insurance company make fixed payments over a period of time. The decision depends on your financial situation. You may want smaller fixed payments in order to have a steady income and to pay less tax on the money. Or you may want the full amount immediately to pay bills or to invest. You should consider consulting a lawyer or financial advisor about this decision. The deceased is considered to be covered by Social Security if he/she paid into Social Security for at least 40 quarters. Check with your local Social Security office to determine if the deceased was eligible. If the deceased was eligible, there are two types of possible benefits. A death benefit of $255 [in 2009] toward burial expenses is usually available. You can complete the necessary form at your local Social Security office, or you can ask the funeral director to complete the application and apply the payment directly to the funeral bill. This payment is made only to eligible spouses or to a child entitled to survivor’s benefits. Survivor’s benefits for a spouse or children. If the spouse is age 60 or older, he/she will be eligible for benefits. The amount of the benefit received prior to age 65 will be less than the benefit due at age 65 or over. A disabled widow age 50 or older will be eligible for benefits. The spouse of the deceased who is under 60, but who cares for dependent children under 16 or cares for disabled children, may be eligible for benefits. The children of the deceased who are under the age of 18 or are disabled may also be entitled to benefits. When applying for Social Security benefits, you should have available the Social Security number, birth and death certificates of the deceased, marriage certificate and Social Security number of the spouse, birth certificates and Social Security numbers of any dependent children, and copies of the deceased’s most recent federal income tax return. Copies of a marriage certificate are available at the Office of the County Clerk where the marriage license was issued. Copies of birth certificates are available at either the State or County Public Health offices where the child was born. If the deceased was a veteran who received a discharge other than dishonorable, the survivors may be eligible to receive a lump-sum payment of $300 for burial expenses and an allowance of $300 for purchase of a plot in a private cemetery. 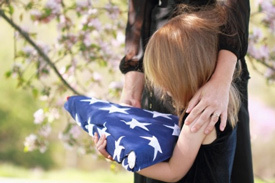 Veterans are also eligible for a headstone or grave marker and a burial flag provided without charge. The funeral director often can help you apply for these benefits, or contact the local Veterans Administration office. Write the Department of Defense’s National Personnel Record Center, 9700 Page Boulevard, St. Louis, MO 63132, if you cannot find a copy of the discharge. The surviving spouse and dependent children of veterans receiving disability benefits may also be entitled to monthly payments. Check with the local Veterans Administration office. If the deceased was employed at the time of death, you should contact the employer regarding any benefits for the survivors. The employer may have provided life, health, or accident insurance that will yield payments. The deceased may be due a final paycheck for vacation or sick leave. If the death was work-related, there may be worker’s compensation benefits. Also check with the employer to see if the deceased belonged to a union or professional organization. These groups may offer death benefits for their members. You should contact all past employers, including federal, state, or local government, to determine if the survivors of the deceased are entitled to any payments from a pension plan. If the deceased was already retired and received a pension, you should check with the employer to determine if survivors will continue to receive a pension payment and whether the payment will be reduced. For purposes of the Will, state and federal taxes, and probate, it is necessary to make a complete list of all property, including real estate, stocks, bonds, savings accounts, and personal property of the deceased. Land titles, stock certificates, and other financial papers may be stored in a safe deposit box or other secure place. If the deceased did not have a Will, this is referred to as dying "intestate" In this case, the estate, including property and assets belonging to the deceased, will be disbursed according to state law. This will not include property where the title is in the name of the deceased and another person. This property will automatically pass on to the co-owner. The appointment of an individual by the court to act as a "personal representative" or "executor" of the estate. This person is often named in the Will. If there is no Will, the court will appoint a personal representative, usually the spouse or a relative. Proving that the Will, if it exists, is valid. Informing interested parties, especially heirs and beneficiaries, that the Will is being probated. Disposing of the estate by the personal representative in accordance with the Will or the laws of the state. In California, the Superior Court has jurisdiction over the probate process. The spouse or personal representative named in the Will must file a petition with the court within 30 days after death. There is a filing fee for this process. Depending on the size and complexity of assets subject to probate, you may require legal assistance. Check with who has jurisdiction in your state. Assets that are in probate do not include property where the deceased and someone else are listed as owners. Proceeds from a life insurance policy or Individual Retirement Account (IRA) which are paid directly to a beneficiary are also not subject to probate. Because of changes in recent years, very few estates now have to pay federal estate tax. Contact your local Internal Revenue Service office for form 706. A federal estate tax return must be filed and taxes paid within nine months of the date of death. Check with your state to see if you must file a state estate tax. In California there is no state inheritance tax. Beneficiaries who live in another state will follow inheritance tax requirements, if any, for that state. The federal and state income taxes of the deceased are due for the year of death. The taxes are due on the normal filing date of the following year, unless an extension is requested. The spouse of the deceased may file jointly for the year of death. A spouse with dependent children may file jointly for two additional years. The IRS offers a booklet, Publication #559, "Information for Survivors, Executors and Administrators", which may be helpful. You can obtain this booklet at http://www.irs.gov/uac/About-Publication-559 or by contacting your local IRS office. The phone number is listed under IRS Forms in the government section of your phone directory. It is important to check on these as soon as practical. Some may carry insurance clauses that will cancel them. If there is to be a delay in meeting payments, consult with creditors and ask them for more time before payments are due. Cancel credit cards held exclusively in the name of the deceased. Any payments due on these cards should be paid by the estate. There may be credit cards in your and the deceased name, or you may have used cards which listed only the name of the deceased. In this situation, your own credit rating will be affected if you do not continue to make payments. You should begin to notify the credit card companies that your spouse is deceased, and that the card should list your name only. Some people, particularly widows, may experience difficulties in getting a new card if they do not have their own credit rating. When applying for a card, inform the lender about credit cards you shared with your spouse, even if your name was not listed. Debts owned by the deceased will be the responsibility of the estate and should be forwarded to the personal representative or executor who is settling the estate. However, debts which are jointly owned, particularly mortgage payments and utility or phone bills, should be paid by the survivor in order to keep a good credit rating. An extra word of caution to widows and widowers: it is generally suggested that you do not immediately make permanent significant financial decisions, such as selling your home, moving, or changing jobs. You should take the time to consider your situation so you can make these decisions responsibly. If at all possible, don’t rush into a decision you might later regret. For policies held by the spouse of the deceased, beneficiaries may need to be changed. You may decide you no longer need to have the same amount of life insurance if you do not have dependents. Auto insurance and home insurance may also need revision. You may need to purchase your own medical insurance if you were covered under the deceased’s work policy. Check with the employer to see if you can continue with their group health insurance plan, which may be less expensive. Contact the company issuing the policy to make any changes, or for more information. Check with your motor vehicle department to see if the ownership of the car owned by the deceased needs to be changed. Your Will may have passed property on to the deceased, and should be updated. You may want to contact your attorney for assistance. If you had a joint bank account with the deceased, it will automatically pass to you. You should check with the bank representative to change the title and signature card of the account. To change stocks or bond titles, check with your stockbroker. If the bank account was held only in the name of the deceased, those assets will have to go through probate. An exception to this would be trust accounts. If the box was rented only in the name of the deceased, it will require a court order to open the box. Only the Will or any other materials pertaining to the death can be removed until the Will has been probated. In California if the safe deposit box was rented in joint names, you will need a letter from the Superior Court Probate Division to get access into the box. Contact the Superior Court for details. You may need or desire the services of a professional, particularly a lawyer or a financial advisor. It may be easy initially to use the services of the lawyer who wrote the Will for the deceased or to work with the financial advisor of the deceased. Or you may wish to locate another professional with whom you feel more comfortable. One good place to begin finding names of competent professionals is from friends or family members who have had successful dealings with the kind of advisors you are seeking. Professional organizations, such as the local Bar Association, may be able to provide referrals. In the event the deceased was living alone at their residence, consider having the post office forward mail to a person responsible for estate matters. Remember, death statistics are public records. In the event the survivor might be vulnerable to pressure or fraudulent approaches, consider changing the mail delivery to the address of a family member or legal representative who can monitor potentially questionable situations. In some instances, it might also be advisable to change the survivor's phone number as well.